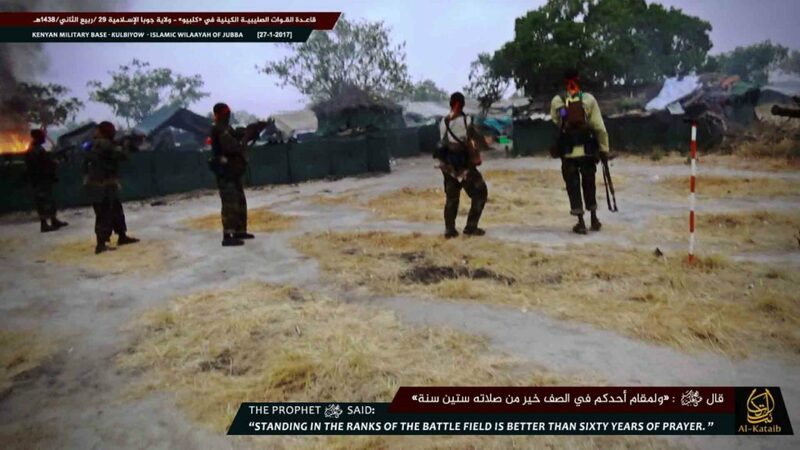 In photos released yesterday, Shabaab, al Qaeda’s branch in East Africa, detailed last week’s deadly assault on a Kenyan Defense Forces (KDF) base in southern Somalia near the Kenyan border. The raid came just over one year after another assault on a KDF base in El Adde, which killed more than 100 Kenyan soldiers. 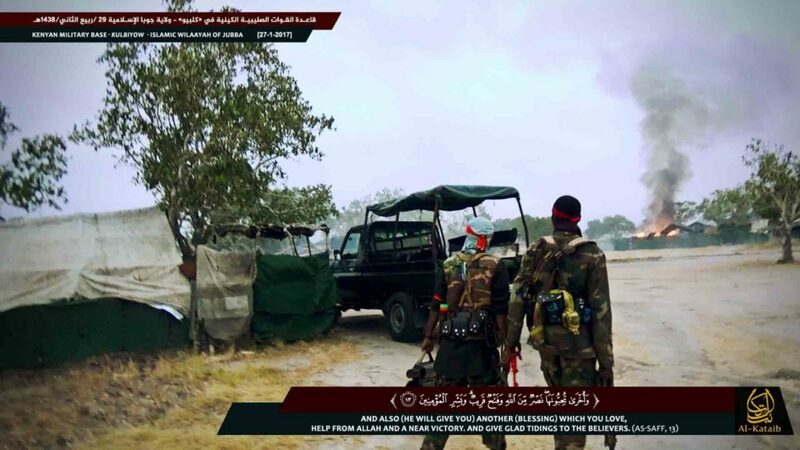 In last week’s assault, Shabaab said its “Saleh al Nabhan Battalion” launched a coordinated, large-scale attack on the base. The attack began with two simultaneous suicide bombings, followed by an assault team breaching the perimeter of the base. 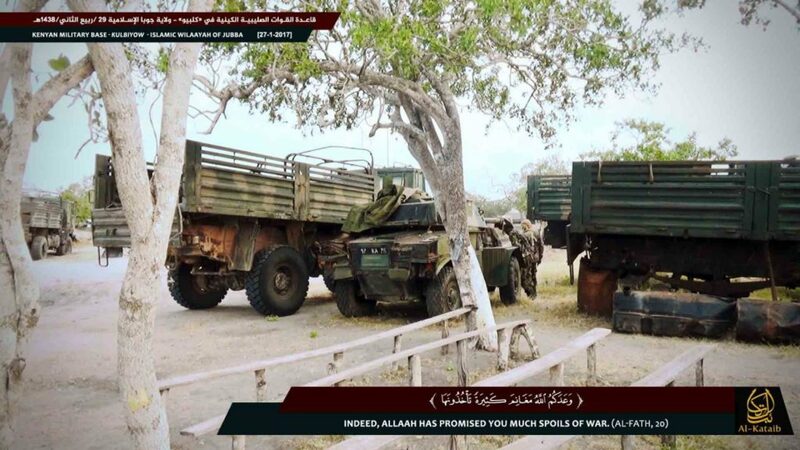 According to Shabaab, “more than 67 KDF troops were killed.” However, in the photos only around 50 bodies are shown. 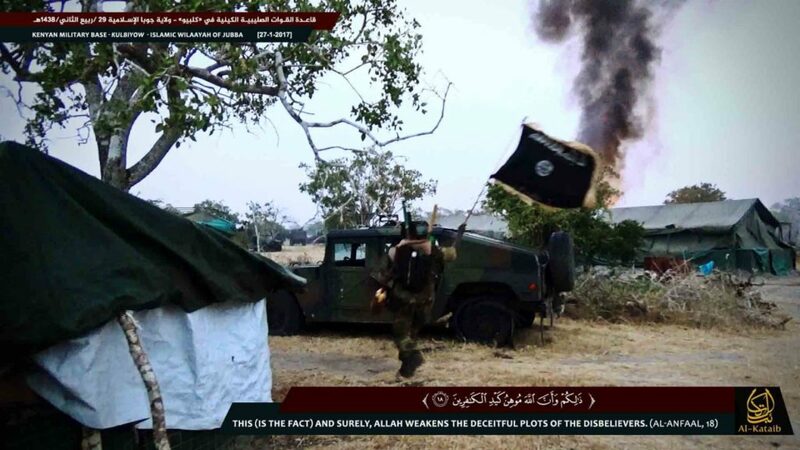 The jihadist group was able to capture the base and took vehicles and supplies before withdrawing. A KDF spokesman denied Shabaab’s version of the events in a comment to Al Jazeera. “Shabaab is known for propaganda, whatever they are saying about the attack is incorrect, including the number,” he told the news agency. Speaking to The Guardian, another spokesman completely denied the attack compromised the base. “[Kenyan] soldiers repulsed the terrorists, killing scores,” the spokesman said. KDF officials also initially downplayed last year’s attack in El Adde. At first, the KDF downplayed the size of the attack before being forced to admit casualties. 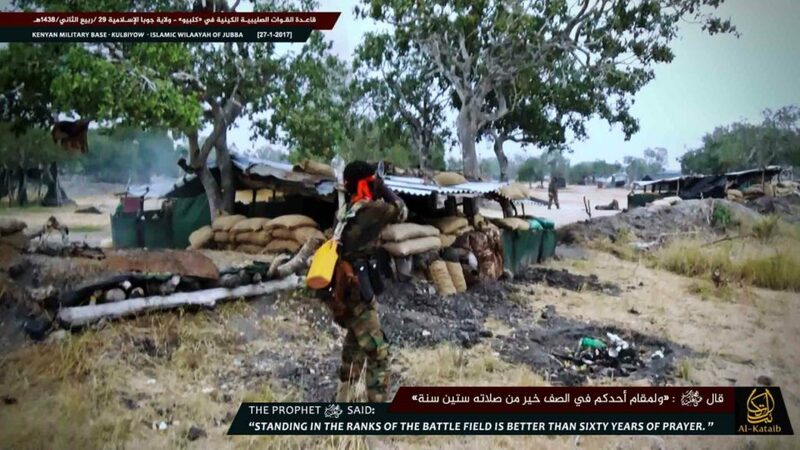 The initial estimate was around 60 KDF killed, however, as investigators and other personnel combed the base after Shabaab fled, the number quickly rose. It is now believed that around 100, if not more, KDF soldiers were killed in that raid. 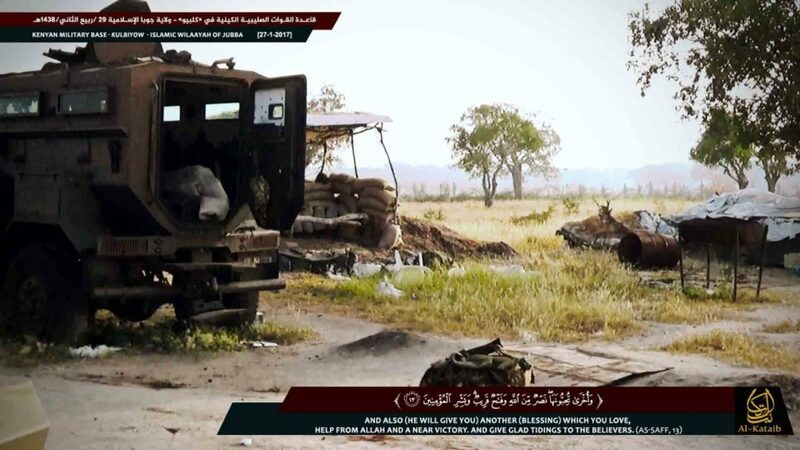 The “Saleh al Nabhan Battalion” is named after the senior Al Qaeda East Africa operative of the same name. Al Nabhan was wanted by the FBI for his involvement in the 1998 US embassy bombings in Kenya and Tanzania before being killed by US forces in Somalia in 2009. The Kenyan jihadist was also wanted for his involvement in a 2002 strike on an Israeli hotel and an airliner in Mombasa. This was the same battalion that carried out the El Adde attack. Shabaab continues to be a constant threat to African Union, Somali, and other forces inside Somalia. It has also continuously targeted African Union troops in southern Somalia and has taken back some territory in the process. 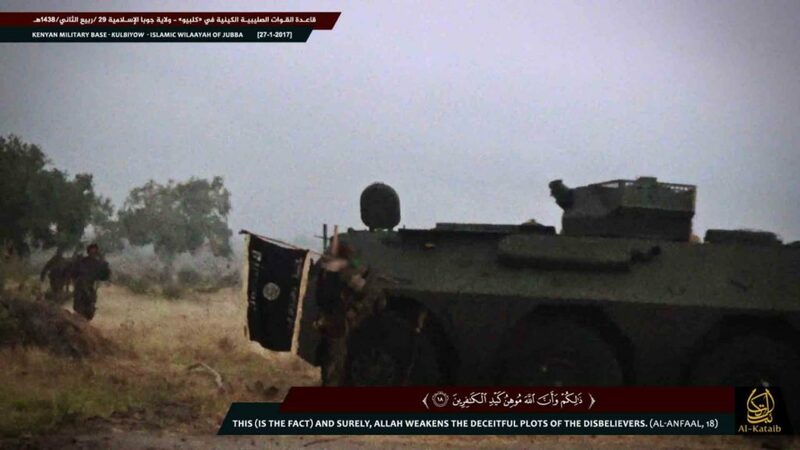 The jihadist group has also been able to mount attacks in the central part of Somalia and into neighboring Kenya, as well. In the first place, the kenyan have absolutely no business whatsoever meddling with somalian internal affair. No matter the numbers, it never should have happened, or should have been repelled from the onset. No guards ? No perimeter security ? It’s a war, not an holiday excursion . It’s incredible to me that so many KDF were killed in this raid, and I wasn’t there, and I’m not trying to insult the KDF, or their men, they’re serving their country, and I respect them for that. That being said, it’s just a sad matter of fact that more often than not, the version of events put forward by terror groups regarding raids and other operations is more reliable and bears more similarities with actual events on the ground, than does the “official,” version of events put out by bureaucrats, or higher command, especially in Somalia, but I’ve noticed it in Afghanistan too. 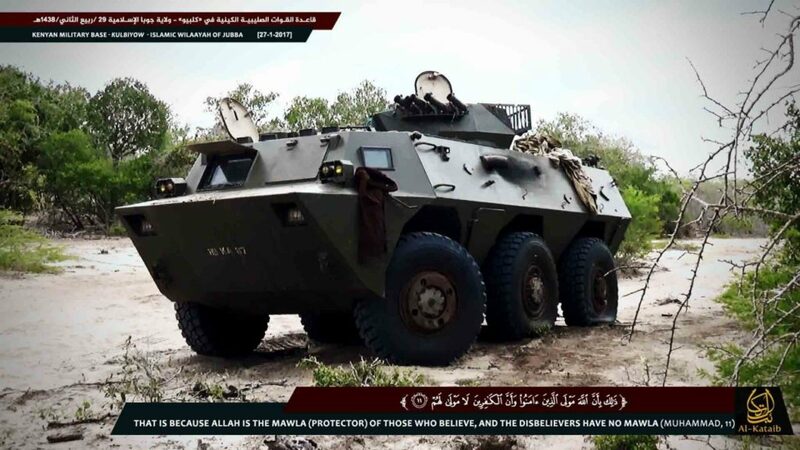 What we probably got from Shabaab was more their plan, or how they intended to execute thier raid on the KDF forces, being with the two simultaneous suicide car bombs, closely followed by a large assault force. 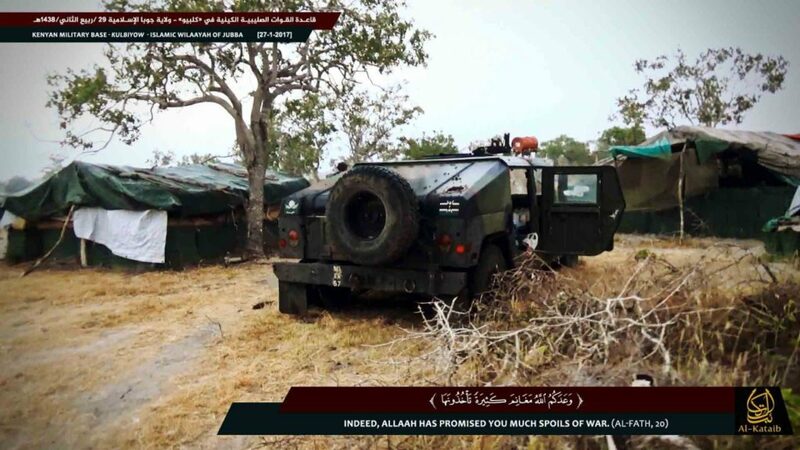 It may be the case that, at some point in the attack, the KDF may have tried to run, or break out of what they perceived as an encirclement by Shabaab forces. Not everyone was killed at that base, there had to have been some survivors. The photos provided don’t necessarily denote a complete and total take over of the base, it’s possible that some portion of the base was lost, with an element retreating to another position that was better defended, leaving behind a rear guard. It’s also possible that the base was completely overrun, there were no holdouts, and the only survivors were ones who fled in vehicles, leaving their brothers behind to fend for themselves, and I’m just going to say it, it was probably the officers who turned tail and ran, leaving the enlisted men behind, it’s happened before, more than once, and it’s a quick acting poison that induces panic, and when men panic in combat, and turn to run as one large group, backs to the enemy, weapons either discarded or not being employed to provide a covering fire for their maneuver, they are easily killed en masse. I sincerely hope that’s not what happened, but the unacceptably high body count on the KDF side strongly suggests otherwise. I was assigned to the U.S. Embassy in Nairobi circa 1992 – 1995 and had an opportunity to observe the, now called, KDF. Let’s say they need assistance and I’ll leave it at that. Kindly let us know the major weaknesses. Am still keen on Kulbiyoh attack, if what we see and hear is true, then a lot more needs to be done by KDF in form of strategy and counter attack measures. if intl was received as alluded, then why was air power and other forms of support not deployed considering that it was just dawn? the KDF/Amisom war planners in my opinion are wanting. Whoever has more details, please help us understand whether these pictures are from el adde or kulbiiyoh attacks. Secondly, the kdf should have invested heavily in night vision equipment, how about the traditional para illums? these should have lit the enemy position.